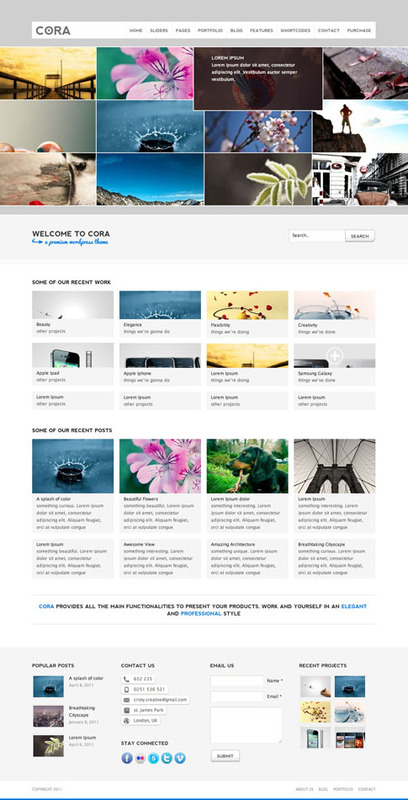 Cora premium theme is one of the most robust, full-featured WordPress layouts I’ve tried out in a while. Cora’s styling is bold and clean, making it ideal for contemporary business sites, personal blogs, online portfolios, and photography galleries. Cora theme’s true power is in its admin panel, which makes it extremely easy to add sliders to any page, post, or portfolio item! Pile on fifty shortcodes, thirteen custom widgets, and five incredible sliders and you’ve got yourself one incredibly flexible premium WordPress theme — Cora definitely deserves a spin at the end of the post to take in all of its great, jQuery awesomeness! Twitter, Flickr, Google Maps, and much more!